Afghanistan President Ashraf Ghani, center, poses with U.S. and local military officials during a ceremony after receiving two Black Hawk helicopters from the U.S. government, at Kandahar Air Field, Afghanistan, Oct. 7, 2017. 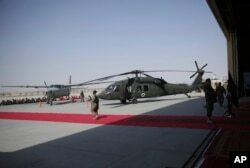 The United States has formally handed over two UH-60 Black Hawk helicopters to the Afghan Air Force as part of a plan to increase its capability and sustainability in counter-Taliban operations. The handover ceremony took place at the airfield in Kandahar as the U.S.-led international military intervention in Afghanistan entered its 17th year Saturday, with no end in sight for the war against an Islamist insurgency. Afghan President Ashraf Ghani, in accepting the new aircraft, called it a "historic day" and used the occasion to urge the Taliban to end the violence. Ghani said if the Taliban thinks it can defeat Afghan security forces, it needs to abandon the idea in the wake of the growing strength of Afghanistan's national army and police forces. "End the war, stop bloodshed. The way forward for you is to negotiate a political solution," the Afghan leader asserted. General John W. Nicholson Jr., the top U.S. military commander in Afghanistan, echoed Ghani's words, saying the Taliban cannot win on the battlefield. U.S. soldiers and locals walk near a U.S. Black hawk helicopter, donated by the U.S. government, during a ceremony at Kandahar Air Field, Afghanistan, Oct. 7, 2017. "Doubling of the Afghan special operations forces and the tripling of the Air Force, increasing offensive power of the Afghan National Army, all mean one thing: This is the beginning of the end for the Taliban," the NATO commander said. Washington plans to supply a total of 159 Black Hawks to the Afghan government by 2024, including 58 fitted with extra battlefield weaponry to provide close air support to ground forces.The Black Hawk will eventually replace the aging Russian-made MI-17 helicopters currently in use by the Afghan Air Force. A Taliban spokesman promptly responded to statements by Ghani and Nicholson and reminded them "our fight is not based on technology but is an ideologically motivated fight." In a separate statement issued in connection with the October 7, 2001, U.S.-led invasion of Afghanistan, which ousted the Taliban from power, the Islamist insurgency vowed to defeat and force "all occupying troops" out of the country. "The best way forward for the American invaders is to understand realities, respect freedom of other nations, prevent further human and material losses, end the longest war in your history ... withdraw your occupation forces ... and stop throwing yourself into the ditch of destruction by insisting on arrogance," the Taliban said. The Taliban currently controls or influences more than 40 percent of Afghanistan.